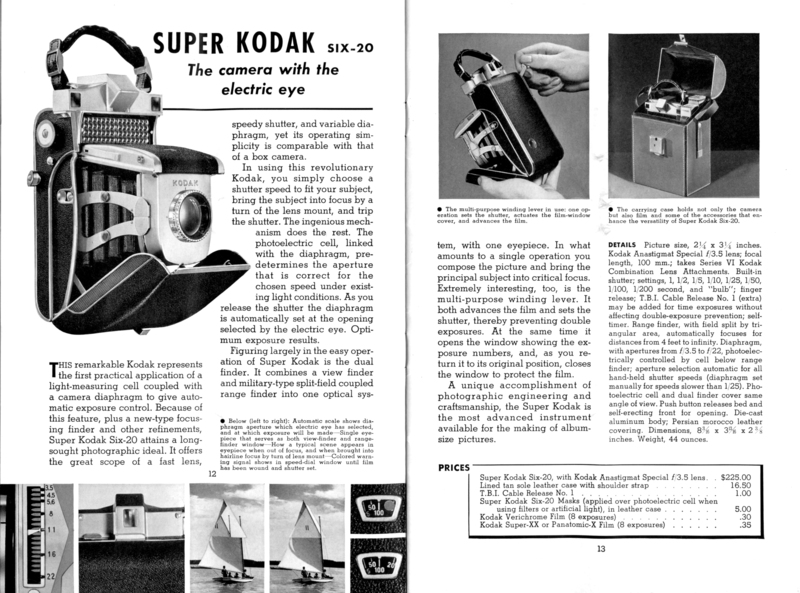 Kodak's Super Camera. It had a selenium photocell integrated into the camera, and it was directly coupled to the diaphram for automatic exposure some 25 years before it became common on other cameras. They fnished it up by putting on a killer Ektar lens. Kodak could make a great camera when they felt like it. Unfortunately, it cost $225 in 1940, while the Depression was still going on, about the price of a Leica. A new car cost around $2,250. Kodak's 3A folding camera cost about $42.50. A Kodak 35 was under $20, and a Brownie box was between $1 and $5. Not many of these things were sold.